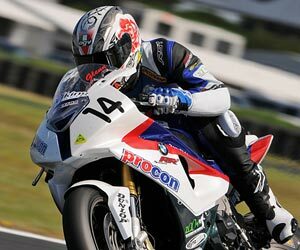 Procon Racing BMW rider Glenn Allerton has dominated a drama-charged day at Phillip Island, winning both races of the opening round of the Viking Group Australian Superbike Championships in spectacular style. The field was forced to gamble after the race 1 out lap, with a damp circuit sending some riders scrambling for spare bikes with wet tyres fitted. The BMW S 1000 RR-mounted Allerton elected to remain on slicks, and despite being swamped in the opening laps, soon found pace as a dry line around the 4.45km circuit emerged. 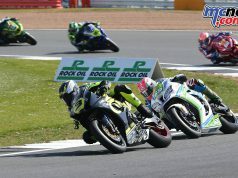 The 30-year-old picked off place after place, and by the fifth lap found himself in the lead after blazing past polesitter Wayne Maxwell who was struggling on deteriorating wet rubber. Allerton greeted the chequered flag with a lead of over 20 seconds, with second-place going to another European machine, the Aprilia RSV-4 ridden by Ben Attard. Proving the victory was no fluke, the NSW-based rider backed up the performance by winning race 2 in dry conditions, again by a solid margin. Two wins from two starts, on debut with a new team and race bike, has Allerton excited about his championship chances in 2011. “This is the best start to a season I’ve ever had,” said an ecstatic Allerton. “The weekend really could not have gone better for us given we are a new team and racing a new bike. “We made a good choice this morning on the slicks but in the second race showed that the pace was genuine. Allerton is looking forward to continuing the form at his favourite track on the calendar next weekend. Allerton leaves Phillip Island with a 13-point advantage over second-placed rider Troy Herfoss, who was impressive in his first ever Superbike outing with Team Suzuki. Herfoss’ result was built on both speed and consistency. The GSX-R1000 rider settled for a strong fourth place in the opening race when unable to attack, but was on song in the second 12-lapper and raced to a comfortable podium position. “It was a tough weekend and I’m very glad to come away sitting second,” said Herfoss. “Our testing pace was great so I was a little confused as to why I was taking a while to get comfortable on the bike. “Getting a good result on wet tyres in the first race gave me the confidence I needed, and I was able to mix it with the leaders in the second. 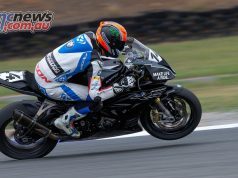 A storming ride from iStyle The Natural Aprilia Racing Team’s Ben Attard has him sitting just a point behind Herfoss in the race for the Viking Group Australian Superbike Championship crown. Attard and his Aprilia RSV-4 showed pace in both races. He finished a solid second behind Allerton in race 1, also gambling on slicks on a drying track. Fifth place in the second race rounded out a commendable weekend for the vastly-experienced rider. “We’re still developing the bike but saw a chance in the opening race and pushed on with slicks, which paid off,” said Attard. Demolition Plus GAS Honda’s Craig Coxhell finished fourth for the weekend with two top-five finishes. Team Honda Racing’s Jamie Stauffer rounds out the top five in a weekend that went awry for the factory outfit. Stauffer’s teammate and polesitter, Wayne Maxwell consolidated in the opening race with a podium but a mechanical problem this afternoon sees him languishing in tenth overall. Yamaha rider Cru Halliday took Prostock honours today after finishing both races, contested with the Superbike field, in the top three. Halliday finished third in the opener behind Victorian John Phelan, but bounced back in the dry to record a win. He leads the Prostock standings by 5 points over Phelan after the first of 8 rounds. Linden Magee rounds out the top three on 33 points, 6 shy of Phlelan, after a consistent weekend. In the Supersport ranks, Gobert Motorsports rider Aaron Gobert controlled proceedings on a damp track, using his experience to race to a deserved win aboard his Yamaha R6. Combined with a fourth place in yesterday’s race, today’s result was enough to give Gobert the round win and sees him lead the championship heading to Tasmania. “We had the bike setup really well for the conditions today and I felt really comfortable,” said Gobert. Two second-place finishes to the Yamaha Racing Team’s Kevin Curtain sees the experienced campaigner sitting in second after an eventful Phillip Island weekend. Polesitter and race 1 winner Brodie Waters finished third for the round on his Team Suzuki machine after running off the circuit in this morning’s 12-lap decider. A fellow Suzuki rider benefited from Waters’ misfortune; Queenslander Blake Leigh-Smith took a deserved race podium, his first in the Supersport class. 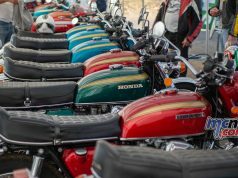 Teams and riders will now set their sights on next week’s second round to be held at Symmons Plains Raceway in Tasmania.